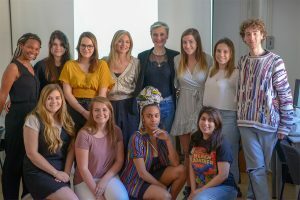 I was delighted to be the client for Prof. Sabrina Schmidt’s talented group of students taking Advanced Graphic Design at John Cabot University in the spring. This is one of the many courses that integrates the Learn-Do-Share program created by the JCU Institute for Entrepreneurship, bringing real companies into the classroom. 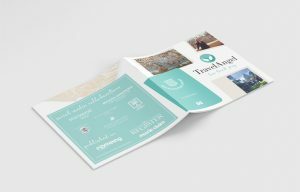 The students’ tasks were many – from rebranding my TravelAngel blog and incorporating a new tagline to designing promotional materials such as business cards, brochure, bookmark and bag! Their fresh ideas, enthusiasm and above all, talents in graphic design, were developed and honed by Prof. Schmidt over the semester and as you can see from my new social media kit, the final result designed by Samantha Gleason is stunning! I know Prof. Schmidt particularly looks forward to meeting her visiting students each semester because they often arrive with advanced technical skills and can enjoy the creative but busy design schedule that is meticulously planned out for them. One of the key pieces of feedback we get from our SAI students like Sam is how exciting it is to be working on real clients’ projects in real time, with the added possibility to continue working for the client (and being paid!) even from afar. Sadly, for JCU and for me, Sam has returned to her home university of Pennsylvania State. However, she is continuing to work for me on my branding and some new design projects. So it’s an exciting time for both of us! As an advertising major, I usually do not have the time in my schedule for creative classes. 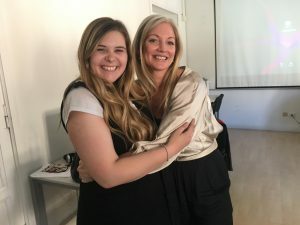 I chose to study with SAI in Rome because the program offered so many unique courses that would allow me to explore my creativity. AS330, or Graphic Design: Corporate Identity and Branding, was the perfect class for this, and I was able to get experience working with a real client – Joanne Bergamin a.k.a. 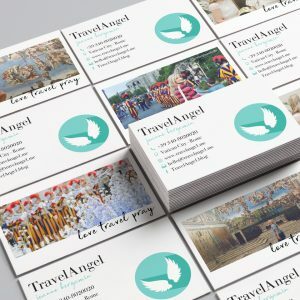 TravelAngel. We were given a brief on the first day of class with the guidelines for the brand design, describing the personality and goals of her business. Most of our class time was spent working individually on our ideas for the brand, but the class had group reviews every few weeks, where we could get feedback on our work and get different perspectives. I have taken similar classes in the past, but the diversity of cultures and backgrounds of the students made the designs and the feedback unique. Designing in an international setting requires more background research, feedback from locals, and an understanding of multiple cultures. I remember a few instances in reviews that the international students pointed out the meaning of an icon or color that was particular to their country, and changed our view of the design completely. The class size was also much smaller than most of the classes I have taken at Penn State, and I was able to have one-on-one time with the professor every class to get her feedback. 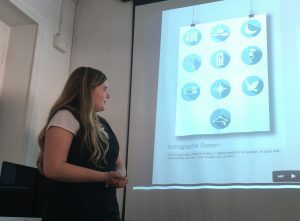 Our final presentation was very similar to an agency presenting to a client – each student had to pitch their brand identity in front of the class. I was so honored and excited that Joanne chose to use my designs, and it has been such a pleasure working with her to finalize and implement my ideas! This class gave me the opportunity to understand how to work with a client, design for their needs, and take and grow from constructive criticism. As a student, it is very rare to be given the opportunity to create a full professional brand from scratch, especially for an international client. Seeing Joanne use my designs on her website and social media has been extremely rewarding, and this project is the perfect piece to add to my portfolio and resume!